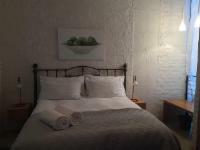 The Apartment sleeps up to four people, with two double en-suite bedrooms, and a fully equipped kitchen. There is also a living area with floor-to-ceiling sliding windows which create a sense of space. Although the kitchen is equipped for self-catering, meals can be taken at Bellevue Café, which is based on the campus, and a host of other restaurants in the area. The buildings of Bellevue Campus are situated around a central piazza or town square, which features a pond, greenery and low-walled seating. The design accommodates the beautiful trees and indigenous vegetation on the property. Perfect apartment, great communication, lovely location. Very modern/ stylish apartment , perfectly located and offets a relaxing quiet retreat at the rnd of the day. beds were a class of comfort not often found these days. Cathy was very friendly and helpful host . no question about it, would definately choose to stay here again. We could have stayed for much longer. Alas, our time there passed too quickly. With the lounge windows opened fully it felt like we were in a tree house. The apartment is very stylishly and comfortably furnished. Cathy was attentive and nothing seemed too much for her. The free Wifi was great and was very appreciated. We will be back if we have an opportunity. There is no lacking of taste and class in the design of the Bellevue Apartment. Nothing is out of place. It is secluded and quite and felt more like home than hotel. Apartment on Bellevue is 21.1km from the centre of Durban , the nearest airport 36.6km (King Shaka International Airport).